Research from Spain backs up what your taste buds have known all along: sautéing vegetables in a little olive oil is preferable to boiling them. Scientists who cooked a variety of vegetables by diﬀerent methods and then measured the vegetables’ antioxidants and phenols (health-promoting compounds) found that “the presence of EVOO (Extra Virgin Olive Oil) in cooking increased the phenolics…in the raw foods.” Interestingly, adding olive oil to the water when boiling didn’t oﬀer the same beneﬁts as frying or sautéing in EVOO. EVOO plays a key role in getting the most out of uncooked foods, too. Top your salad with fat-free dressing and your body won’t be able to access key fat-soluble vitamins like Vitamin A. A simple vinaigrette made with olive oil helps unlock all the goodness in your salad. Bonus: When your vegetables—raw or cooked—taste better, you’re more likely to want to ﬁll up on them. But why limit your enjoyment of EVOO simply to vegetables? On an Oldways trip to Puglia, in the heel of the boot of Italy, we once had a multi-course tasting meal where every dish featured olive oil. We started with a fennel-citrus salad lightly dressed in olive oil, continued through soup, beans, meat, seafood, pasta, and greens, then ﬁnished with house-made ice cream drizzled with olive oil, paired with a delicate olive-oil cookie. Everything was delicious. 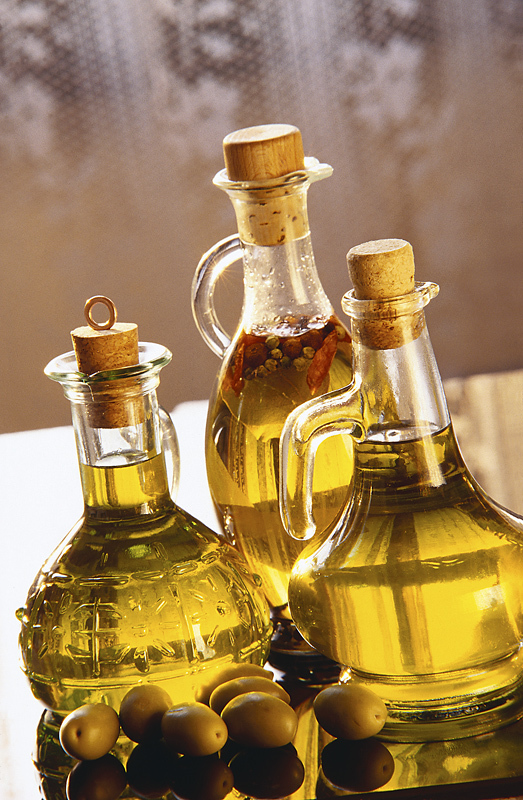 Olive oil is at the core of the Mediterranean Diet. In fact, some food historians deﬁne the Mediterranean Diet as the “traditional eating patterns in areas around the Mediterranean Sea where olives are grown.” Although study after study ﬁnds that the Med Diet’s health beneﬁts come from the interplay of many food groups, olive oil is always part of the picture. When it comes to choosing olive oils at the store, make sure to look for EVOO. EVOO is produced by mechanically crushing olives to separate the liquids from the solids, then further separating the liquids into water and oil. No heat or chemicals are used in this process, which is the starting point for EVOO. Oil that doesn’t qualify as EVOO—either because it didn’t meet the standards, or because it was further reﬁned with heat and chemicals—can still be found on store shelves, with names like light, extra light, classic, pure, or just plain olive oil. These choices will be less expensive than EVOO, but will likely have lower levels of the healthy compounds found in EVOO. Look for a “best by” date at least a year in the future. Most producers label their EVOO with a date that’s about two years after bottling; quality will be even better in the ﬁrst year after bottling. Some brands also include a harvest date, providing an extra clue for freshness. Choose oils in dark bottles or tins, since light degrades the quality of EVOO. Buy only as much as you’ll use in about two months. Keep your EVOO in a dark cupboard away from the stove. For inspiration in using EVOO in all kinds of Mediterranean dishes, check out our Mediterranean Diet menu plan! I use EVOO purchased from a shop that specializes in various sources of EVOO. I like using the oil in my old fashion cornbread.